Can dogs eat apples and apple skin? We know that feeding our beloved best friends the same specialized dry dog foods every single day is probably the best thing for their health. But it can be incredibly tempting to introduce our dogs to the wonderful array of foods that we humans get to enjoy on a daily basis. While it’s OK to give into temptation every now and then, it’s crucial that you know exactly what you are feeding to your dog, and whether or not their furry little bodies can accept it. One of the most common questions that dog owners tend to ask, is whether or not dogs can eat apples. We know apples are tasty, and we know they’re incredibly good for humans, but what about our faithful four-legged friends? Can dogs eat apples too? Chances are, if you’re an apple lover yourself, you’ve already given into the temptation and “accidentally” dropped a slice or two for your dog to enjoy. If you have, then there’s absolutely nothing to worry about since apples are a great addition to a dog’s diet. That is, as long as you know which parts are actually good for them. In short, the answer is yes, you can feed apples to your dog. In fact, they can be a very nutritious snack for dogs if given in the correct quantities. While it’s true that dogs are generally more carnivorous by nature, that doesn’t mean they can’t enjoy the sweeter things in life. The majority of fruits and vegetables can be given to your dogs as a healthy treat, and apples are one of the sweetest fruits available. And as they’re incredibly cheap and versatile, they’re a great place to start. Can they eat apple cores? The answer to all three of these questions is generally no, but it really depends on the quantities and the individual dog in question. While apple skin is not necessarily bad for your dog, it can begin to upset their stomachs if they ingest too much. So you must use your own due diligence when deciding to throw them a slice or two. In terms of the apple cores, and the apple seeds, it’s recommended that you completely remove them both before passing an apple over for your dog to devour. This is because the apple cores can pose a choking hazard. And the apple seeds contain small amounts of cyanide, which can be fatal if ingested in large quantities. The chances of any harm being done by the core and the seeds is minimal, but when it comes to your dog, it’s better to be safe than sorry, right? 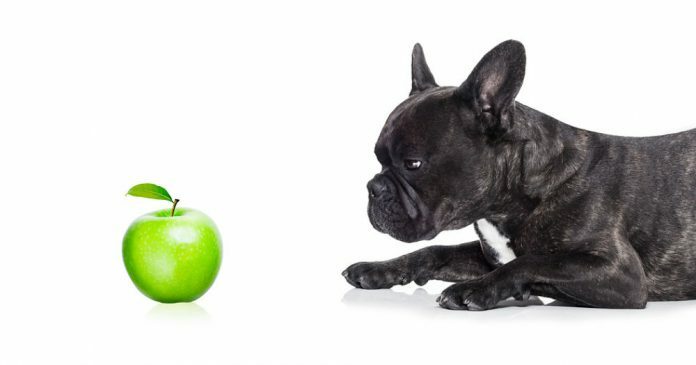 Apples are healthy for dogs in the same way that they’re healthy for humans. It’s the massive amounts of vitamin A, vitamin C, vitamin K, calcium and soluble fiber that make them the perfect snack. Dogs love apples because of their sweet taste and crunchy texture, and it’s easy for them to get carried away if you give them free reign of the fruit bowl. Luckily, apples are very low in calories, so a couple of apples per day won’t cause any problems at all for your dog. However it’s a good idea to incorporate any human foods into your dogs diet slowly, to help their digestive systems get accustomed to the different nutrients. The high amounts of calcium and phosphorus in apples is good for the dogs bones and teeth. 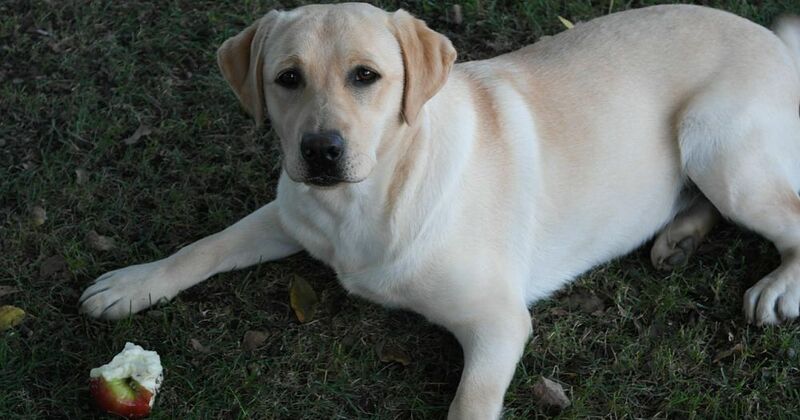 And the omega-3 and omega-6 fatty acids can help improve the condition of their skin and coat. They say “an apple a day keeps the doctor away”, and it turns out the same can be held true for the vets, too! Too much of anything can cause complications in both dogs and humans, and apples are no exception. While it’s true that apples can be nutritious and beneficial to dogs in smaller doses, it’s still not a good idea to just give them as many as they want. Dogs have very sensitive digestive systems, and the smallest change can trigger an upset stomach and diarrhea. The soluble fiber in apples can help alleviate constipation on some occasions, but one too many can have the opposite effect. Another thing to watch out for when feeding your dog apples is the balance of certain nutrients within their blood stream. I know, it’s almost impossible for us to tell without constantly taking them to the vets. But if you know your dog well enough, even the smallest oddities can be easily spotted. Apples contain a lot of calcium, phosphorus and fatty acids. Too much of these nutrients can cause imbalances throughout the dog’s body, which may cause a wide array of symptoms including sickness, fatigue and kidney disease. Of course, these are extreme examples and the chances of your dog ever developing such symptoms is extremely rare. But if you do decide to begin sweetening up your dog’s life with a few apples here and there, it’s always best that you monitor them for any strange behaviours. Stick to one or two apples per day, and your precious pup will be fine. We aren’t so different, our dogs and us. Even the greediest of us can get bored of eating the same type of foods day in, day out. If you’ve decided to incorporate apples into your dog’s daily diet routine, then it’s worth knowing a few different ways of serving them, so they’re less likely to get bored and stop eating them. The most obvious way to serve apples to your dog is to remove the core and the seeds, and to slice it up into 4 or 5 smaller individual pieces. That’s all well and good for the majority of the time, but if you want to try something different then why not grate up an apple, and add it to the top of your dog’s regular dinner? If your dog seems to be getting bored with the same meals everyday, then adding a grated apple to the top can be an easy way to mix things up for them. Don’t worry about the conflicting flavours, they’ll still love you the same! When it’s warm outside, it can be a great idea to slice up some apples and keep them in the freezer. And when it’s cold outside it can also be a great idea to make some warm apple sauce. Apples are a very versatile fruit, and there are hundreds of ways to prepare it for your dogs. Mix it up from time to time, and your dogs will love you for it! Apples can be good for dogs if given to them in the right quantities. You should avoid feeding the apple core and the seeds to your dog though. Make sure you don’t give your dog too many apples, and vary the way you serve them to stop your dog from getting bored with them. Abi is given a treat when we leave the house. Small pieces of apple work great. Cold, crisp and low in calories. I keep a supply in the refrigerator. Thanks, so much, my miniature schnauzers love apples. Was told the peel was toxic. Have been adding slices of apples to their food plus green beans or peas and they love it. Live the idea of freezing apples.